Chris graduated from the University of California, San Diego in 2008 with a B.S. in Bioengineering: Pre-medical. In 2009 he enlisted in the US Army under the 18X program. He was selected for and attended the Special Forces Qualification Course, and graduated specializing in Korean and Mandarin Chinese as an 18D. 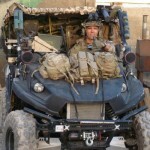 He then served with 1st SFG(A), deploying on missions in Malaysia, Afghanistan, and the Philippines. Chris transitioned out of active duty in 2014 and joined the National Guard as an 18D with 19th SFG(A). He is now pursuing an MBA at Yale School of Management as a member of the Class of 2017.